The Carolina Hurricanes are very familiar with the Penguins, and vice versa, as the two franchises have history together dating back to the Hartford Whalers days. Back then, the Pens dealt for their future captain Ron Francis. More recently, center Jordan Staal was dealt to Carolina, where he now plays with his brother, the face of that club. Since moving to Raleigh from Hartford, Connecticut, the two teams have traded wins and goals back and forth pretty evenly as well. The Pens edge out the 'Canes with a 29-23-9 in the regular season games since the move. In terms of goals scored, however, the two teams couldn't be closer at 178-176 in favor of the Hurricanes. In terms of recent history, it's a different story as the Penguins have won five of the last six meetings between the two. For 2013, the Hurricanes started out strong against a Detroit Red Wings team stacked with superstars. The 'Canes actually handled the Wings for the first 40 minutes of the game, giving up two third period goals, one with only 16 seconds left in regulation. Carolina will try to use that as a lesson to the youngsters on their squad. Play Penguins Hockey - The Pens have much more talent than the Hurricanes, who continue to try finding their way. The Hurricanes have a tough matchup Sunday against Philly where they could learn a thing or two. Soften Up Ward - Cam Ward is, night in and night out, the Canes' best player. The Pens should test him early and often. Plead the 3rd - Surprisingly, the third line has been spectacular so far this season. The Pens should use their depth to their advantage against this weaker team. To quote TJ Curran, my cohost on The League and noted St. Louis Blues fan, "the Panthers are who we thought they are." In that they're terrible. If not terrible, they're terribly inconsistent. One of the last moves the Panthers made before the start of the regular season was signing goaltender Tim Thomas. Depending on who you speak to, Thomas is either a hero or off his rocker. This move will, however land the Panthers several more wins that they wouldn't have had had they not signed him. He remains a great option, especially for a team in transition in terms of players and, more importantly, ownership. season, will be asking for. Beat Them Early - The Panthers have had a tough time recently. Getting on the board early would have a lasting effect on the cats and their fan(s). Play Disciplined - Giving Florida power play time would be unnecessary and open the door for an upset. Contain Huberdeau and Versteeg - Jonathan Huberdeau nearly won the Calder Trophy last season by putting up 31 points in his rookie season. Kris Versteeg is coming off an injury that cost him most of last season. If the team is to beat the Pens, one of those two will probably have a hand in it. Tale of Two Hockey Teams would be the most appropriate title of a book centered around the Tampa Bay Lightning. On one night, you may see the high potent offense centered around Steven Stamkos. The next night, they're giving up goals at a pace beyond what even Stamkos can match. A scene we'd like to see Saturday. Steve Yzerman has been tinkering with his lineup since taking over as general manager, to less success than anticipated. This year, he's added rookie Jonathan Drouin and Valtteri Filipula, giving the team a much needed boost to the team's secondary scoring. Defensively, the team needs to improve over last season, having finished with a goal differential of -2 for the year. The biggest problem for the team remains goaltending. 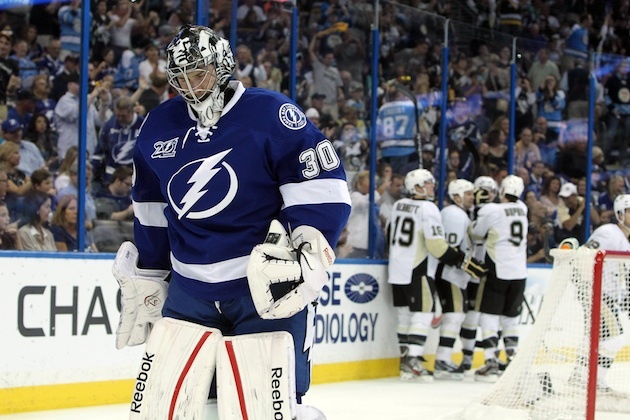 Last season, the Lightning had four different goaltenders start at least two games. Stevie Y's acquisition of big Ben Bishop was meant to remedy that problem. Whether or not he is the answer or just another bad move is yet to be seen. Test the Goaltender - Big Ben Bishop is big. The Pens should aim to bring him down to their level. Play Disciplined - As with Florida, staying at 5-on-5 will benefit the Penguins by limiting unnecessary opportunities for the home team. Stop the Top Line - Martin St. Louis and Steven Stamkos have fun with the Penguins every time they play. The Pens' top four defensemen need to ensure that doesn't happen this time around.